A year is a long time in news - with many thousands of stories written for our readers in the UK and around the world. As our list of the most read stories of 2007 reveals, the articles you choose are not always the ones that lead on the front page. So take a look back at the year, from the serious to the quirky. 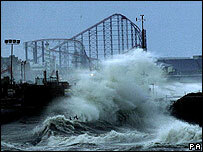 The new year blew in with storms and gales across the UK. Many were affected by the strong winds and heavy downpours which left behind a trail of destruction. Eleven people died in the storms. When a container ship ran aground off the coast of Devon, scavengers swarmed to a nearby beach to help themselves to the washed-up booty, which included gearboxes, nappies, foreign language bibles and BMW motorbikes. Dark clouds looming over the economy have kept business in the headlines for much of this year, starting with a surprise bank rate rise to 5.25%. A media storm erupted over racist comments made against the winner of Celebrity Big Brother. Shilpa Shetty proved that the Channel 4 reality show was still a ratings-winner. But the discovery of a wild Cambodian jungle girl raised more questions than it answered. After January's storms, came the February snows. Up to 10cm (4in) of snow fell in parts of the UK, enough to bring disruption to schools and travellers. 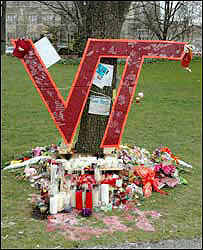 But the snow didn't last and was quickly knocked off the most-read spot by the death of US playmate Anna Nicole Smith. The flamboyant former model died at the age of 39, just a year after winning a share of her dead husband's billion-dollar Texan oil fortune. Did you see the one that didn't get away? 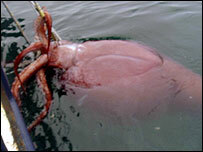 New Zealand fishermen caught a colossal squid, measuring about 10m (33ft) long and weighing 450kg (990lb). The month drew to a close with news that "contaminated fuel" had damaged thousands of cars. Tesco and Morrisons had to withdraw supplies after silicon was detected in unleaded petrol. The first total lunar eclipse in more than three years brought skywatchers across the UK out of their homes to watch as the Earth's shadow covered the moon, giving it a red appearance. It was back to business with Gordon Brown's final budget as chancellor. The news of a surprise 2p cut in the basic rate of income tax provided some welcome cheer - although the cut won't take effect until April 2008. Eurovision TV host Sir Terry Wogan provoked a brief storm of controversy when he announced the wrong winner of the contest for the UK song. In fact, it was Scooch - not Cyndi - who went on to represent the nation's (inevitably doomed) hopes. But perhaps the most dramatic headline of the month was the capture at gunpoint of 15 British Royal Navy personnel. The HMS Cornwall crew members were on routine patrol in the Shatt al-Arab waterway when they were taken. Just under two weeks later they returned home, unharmed, but immediately walked into a row over selling their stories to the media. The deaths of 33 students, during a US university shooting - provoked feelings of grief and outrage and plunged the country into mourning. As details emerged about how the Virginia Tech tragedy unfolded the nation questioned whether Cho Seung-hui, a 23-year-old South Korean, should have been identified as a danger. Back in the UK, one of the longest and most expensive trials in British history finally came to an end with the jailing of five men linked to al-Qaeda, over a bomb plot that could have killed hundreds. The trial lasted 13 months and the jury was out for a record 27 days. The discovery of kryptonite excited scientists and readers alike. The stuff of Superman legend turned out to be white, not green, and it didn't glow, but otherwise its chemical makeup - sodium, lithium, boron, silicate and hydroxide - matched the fictitious mineral. Four-year-old Madeleine McCann disappeared in early May. Her distraught parents mounted a high-profile campaign to ensure she was rarely out of the news in the weeks and months that followed. Tony Blair's final election day as prime minister brought defeat for Labour in the Scottish poll. SNP leader Alex Salmond declared a "wind of change" was blowing through the country. Just days later the PM announced he'd be standing down on 27 June - after 10 years at Number 10. In Sudan, one of the site's most intriguing stories - the man who had been forced to marry a goat - concluded on a sad note when Rose the goat died. Police averted car bomb attacks in central London with a series of controlled explosions. Only a day later, there was a suspected terror attack on Glasgow airport. A blazing vehicle packed with gas canisters was driven into the front of the airport's Terminal One building. The failed terror attacks were to prove a serious first test for new Prime Minister Gordon Brown, who had taken over at Number 10 and unveiled his first Cabinet revamp only the day before. The year 2007 might prove to be the last gasp for reality TV shows, but Channel 4's Big Brother still managed to make the headlines when Emily was thrown out for using a racially-offensive word. But what really provoked a furore was the London 2012 Olympics logo. The design took a year to create but was instantly mauled by the public. BBC correspondent Alan Johnston was kidnapped in Gaza on 12 March. 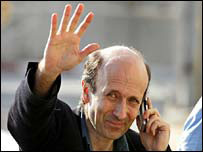 He had been the only international journalist still working in the region and there were great fears for his safety. Up to 200,000 people signed the BBC's online petition for his release and after 114 days in captivity he was freed, aided by a shift of power in Gaza. It never rains but it pours... and this summer was one of the wettest on record. Several days before Mr Brown begun his premiership Hull was under water, but the flooding spread around the UK with Warwickshire, Worcestershire and Gloucestershire, some of the counties worst affected. A week after the downpours, many areas were still under water and when the waters finally did recede the insurance claims began to flood in. The BBC stumbled into trouble with a film clip of the Queen which appeared to show her storming out of a photo session. The corporation apologised when it was revealed the film had been shown out of sequence. Disaster struck in the US state of Minnesota when a road bridge over the Mississippi collapsed, during the evening rush-hour, killing 13 people. 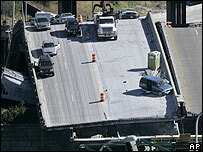 About 50 vehicles were thrown into the water when the bridge suddenly gave way. The southern hemisphere was treated to a spectacular light show of shooting stars known as the Perseid meteor shower. Astronomy Professor David Hughes told readers it was a "laid back form of astronomy" - which you could sit back and enjoy without any special equipment. August drew to a close with a cautionary tale about exotic animals after news that a pet camel killed an Australian woman. The creature was a 60th birthday present, but the 152kg (336lbs) mammal proved too much for its new owner when it crushed her in an overly-friendly moment. How many UK readers had heard the term "sub-prime" before the collapse of Northern Rock bank? The bank was besieged by savers, desperate to take out their money after Northern Rock admitted it was in financial difficulty. Four months after Madeleine McCann's disappearance, public sympathy for parents Gerry and Kate began to ebb as they were formally declared suspects by the Portuguese police. Later in the month, parts of the UK were hit by tornadoes which damaged homes and vehicles and uprooted trees. In one incident, a woman in Luton reported her daughter's trampoline lifted 15ft (4.52m) into the air by a "funnel of wind". Financial news of a better kind - a cut in inheritance tax for couples, announced in the new chancellor, Alistair Darling's, pre-Budget report, grabbed readers' attention in October. And there was promising news on the Middle East with US Secretary of State Condoleezza Rice pledging to address substantive issues and push for a Palestinian state. In the event, the Annapolis summit agreed to work towards a Palestinian state alongside Israel by the end of 2008. In the words of our Middle East editor Jeremy Bowen "At least the sides are talking to each other now". But the question we all wanted answered by the Magazine was why do "normal" people get tattoos? UK families were put on fraud alert after the Government admitted two computer discs containing the personal details of 25 million people had disappeared. The missing data included bank details, national insurance numbers, as well as names and addresses. 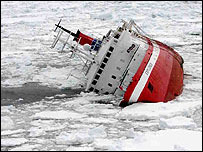 The good news, Chancellor Alistair Darling assured us, was there was "no evidence" it had fallen into the wrong hands. More than 150 people had to be rescued from a stricken Antarctic ship after it hit ice and began sinking during a cruise off Antarctica. The group were taking part in a "Spirit of Shackleton" voyage through the Drake Passage. The discovery of a giant sea scorpion claw, got researchers in Germany thinking. They said the 390-million-year-old specimen came from a 2.5m-tall (8ft) creature - and indicated that other creepy crawlies may have been much bigger in the past than we'd previously thought. News that a UK teacher had been freed from a Sudanese jail following a row over the naming of a teddy bear was greeted with relief by British officials. Gillian Gibbons received a 15-day jail term for calling the bear Muhammad - but was released after serving only eight and allowed to return home. A very relieved - if little overawed - Mrs Gibbons later spoke of her ordeal saying it had all been a huge shock but she wanted to continue teaching. 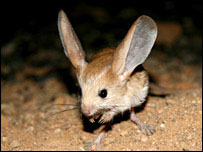 A report containing film of the mysterious desert jerboa - a tiny mouse-like creature never before captured by camera - attracted many readers, probably drawn by the fact the animal has one of the largest ear-to-body ratios on Earth. Then, just as it seemed the year's biggest stories had gone, the assasination of Pakistan's opposition leader, Benazir Bhutto, prompted despair from her followers followed by widespread disorder across Pakistan. There was condemnation from the international community.